Viking Delicacy Caramel Sour Rye is an enzymatically inactive rye malt. 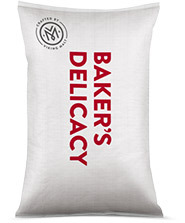 After unique germination and special roasting processes this malt gains its distinctive strong flavor and color. No colorings, preservatives, or other food additives are used. Viking Delicacy Caramel Sour Rye can be used in bakeries to enhance rye flavor and color. Typical dosage rate is max 10%. Viking Delicacy Caramel Sour Rye tunes the color towards gold-red-brown hue within the dosage rate. Viking Delicacy Caramel Sour Rye is strong in taste. First flavor notes are somewhat bitter and roasted with somewhat lingering acidic and dark caramel like flavor.